To carry out a firmware update on your BlackVue dash cam, you will need to format all data on the SD card. Make sure you have copied any important videos you may want to keep from the SD card first as you will lose all data when formatting. Please visit our downloads page for a link to the SD card formatting software you may need. Download the latest firmware for your camera model. Unzip the downloaded firmware file. Need Help on this one? Insert the BlackVue SD card into your computer, using the provided USB reader. Format the microSD card in the Viewer. On Mac, after clicking the Format button, chose MS-DOS (FAT) in the Disk Utility. Copy the entire 'BlackVue' folder to the formatted SD card. Insert the SD card in your BlackVue dashcam and turn the power on to apply the upgrade. The dashcam will reboot automatically after applying the upgrade. Upgrade now completed. If in the event your camera is not powering on, we recommend checking the connections to the camera as well as the power source. The best method in ensuring the power source is still working is to use a test light or dc volt meter. If you don't have a test meter, you can try plugging other accessories into the cigarette port to make sure it is still working. If you have confirmed the device is definitely connected to an active 12V power supply, we recommend finally checking the cigarette cable for any signs of wear or a missing fuse. The tip of the cigarette cable will have a fuse in the end, if this is blown the cig cable will not work. The cig cable may also have an in-line fuse in which this should also be checked. If the system still does not power on after these checks, the device may be faulty and a warranty return is needed. Please proceed to our warranty returns page to complete a warranty return for your system. If the system is outside of warranty, please contact us for further assistance on having the unit repaired by us. 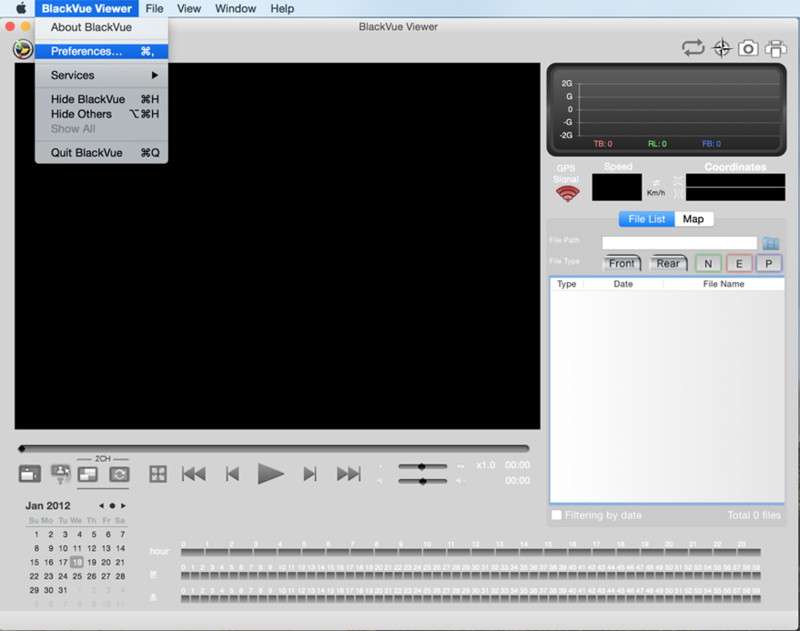 The BlackVue viewer on a Mac operating system is slightly different to what a Windows user will see. Changing the settings using a Mac is fairly simple. To change the settings please click on 'BlackVue Viewer' on the top of your screen near the Apple logo. You will need the viewer program to be running and open to see this. Next, click to 'Preferences...' to change the settings. Easy. ARE THIRD PARTY CARDS COMPATIBLE WITH MY BLACKVUE? BlackVue SD Cards are specifically designed for BlackVue dash cameras. At BlackVue Australia, we and the manufacturer only recommend the use of official Pittasoft/BlackVue SD cards. Many third party cards are not designed for dash camera use and can therefore cause a lot of issue down the track. You may find using a third party card is not causing any problems for a few weeks until it dies. You can end up spending more money going through third-party SD cards than you would by initially purchasing an official recommended BlackVue SD card. With any BlackVue SD card purchase in Australia you will receive a one year warranty. While we do receive both positive and negative feedback on all types of SD Cards, we have found, based on customer feedback, that the BlackVue brand of SD Cards are the most reliable and the most compatible to use with your BlackVue dashcam. Another major benefit to using BlackVue SD Cards is that they come with a 1 year manufacturers warranty. Please feel free to contact us on 08 6267 5167 for any further clarification you may require. If your camera is fairly new and this error message happens, it may be caused by a failed card or faulty unit. If the following recommendations do not work please contact us for a warranty replacement as soon as possible. The most common fix for a 'please check the SD card' message is to format the SD card. To do this wait until the unit is on and operating and then hold down the WiFi button for a good 10 seconds, and shortly after a format of the SD card will begin. If you have the DR3500FHD, or other models, the format option is achieved by holding the Mic On/Off button down. The manufacturer recommends the user format the SD card very 1-2 weeks. The process is very quick & easy as described above. Simply hold down the button for 12 seconds. NOTE: Your settings & preferences will NOT be lost when carrying out this format. If trialling a new SD card does not correct the issue and the camera still gives this error message, the camera itself may be faulty, meaning it has lost the capability of loop recording due to a hardware issue. Please visit the warranty returns page to initiate a warranty claim for your camera. The BlackVue DR500GW, DR550GW & DR650 Series cameras have built-in WiFi which allow them to connect to a smart phone or tablet device via the BlackVue application, which can be downloaded free from the Apple or Android app store. When connecting your camera to your phone/tablet device, please make sure that WiFi has been enabled on the camera and the phone. You then go into settings and find the signal of the camera i.e 'DR500GW WiFi'. Please try carrying out a firmware re-install or update to fix this issue. This process is decribed in the points above. If carrying out a firmware update does not fix the issue, please send the unit back to us with a copy of your receipt and a description of the faulty for a warranty claim. If the camera is restarting after being initially powered on. It can be due to a faulty SD card or file issues on the SD card. Please format the SD card completely and re-insert the card back into the camera. BlackVue systems use a RTC (Real Time Clock) internal battery to maintain an accurate time & date. If there is an issue with system or the RTC has come to the end of its life, the time & date may go out of sync. There are a couple of procedures you can try to rectify this issue before proceeding with a warranty claim. HOW OFTEN SHOULD I FORMAT THE SD CARD? It is recommended that you format the sd card at least on a fortnightly basis, this ensures you minimise the risk of potential errors the card may run into after an extended amount of use. Formatting the SD card is very easy to do and takes only a minute to complete. Simply hold down the WiFi button or Mic on/off button for 10-12 seconds and wait for the beep sound. Then allow the camera to carry out a format and you're done! The BlackVue camera will put the files needed back onto the SD card and your previous settings will not be lost. Easy! It is recommended that you mount the camera high & centre of the windscreen, you can also mount camera behind the cars tint strip to make the installation more discrete, and reducing the amount of direct sun that the camera is exposed to. So yes, you can definitely mount the camera behind the cars tint strip, we recommend positioning it in such a way that the cameras lens sits just below the strip, so the footage is not impacted by the colour/shade of the tint strip. If you experience GPS difficulties after mounting the camera behind the tint ribbon, this may be due to interference if your tint strip uses metallic in it. Please try mounting the camera in an open area to re-test the GPS signal. It is not essential to update the cameras with the latest firmware, however it is recommended to do so when new updates come out. New firmware updates contain improvements to the performance of the car camera and also reduce the risk of issues occurring with the camera. Please check our downloads page for the latest firmware. If you require assistance on updating your camera, please visit our support centre. The brackets are stuck on using high quality 3M adhesive tabs, these can be removed which means they are not a permanent mount. To remove the bracket from your windscreen, simply twist the bracket left & right until the tape starts to give way. The bracket should slowly remove from the glass, you can then use a spare adhesive tab to remount the camera.